The Demise of the Islamist Utopia: What's Next? Islamist movements have dominated popular discussions of opposition and change within Arab politics for the past three decades. Uniquely positioned during the Arab Spring, some have since directly governed, while others have been co-opted or absorbed into existing political structures. Yet outside Tunisia, no Islamist group has been able to deliver upon its promise of political transformation. The reality is that Islamism is not the solution to the problem of authoritarian rule in the Arab world. It is burdened with ideological contradictions, fixated upon principles of doctrinal purity, and beholden to political strategies that have backfired. Islamists have therefore become disconnected from the youth generation that will mobilize the next wave of regional change. The question remains as to how the popular need for religiosity and religious meaning will be taken up by political actors. Hicham Alaoui is a Research Associate at the Weatherhead Center for International Affairs at Harvard University, specializing in issues of comparative democratization. He is completing his D.Phil. 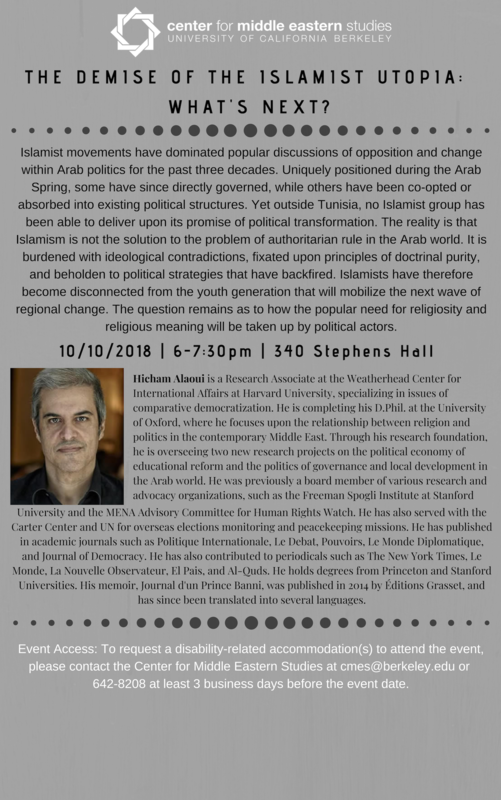 at the University of Oxford, where he focuses upon the relationship between religion and politics in the contemporary Middle East. Through his research foundation, he is overseeing two new research projects on the political economy of educational reform and the politics of governance and local development in the Arab world. He was previously a board member of various research and advocacy organizations, such as the Freeman Spogli Institute at Stanford University and the MENA Advisory Committee for Human Rights Watch. He has also served with the Carter Center and UN for overseas elections monitoring and peacekeeping missions. He has published in academic journals such as Politique Internationale, Le Debat, Pouvoirs, Le Monde Diplomatique, and Journal of Democracy. He has also contributed to periodicals such as The New York Times, Le Monde, La Nouvelle Observateur, El Pais, and Al-Quds. He holds degrees from Princeton and Stanford Universities. His memoir, Journal d'un Prince Banni, was published in 2014 by Éditions Grasset, and has since been translated into several languages. © Copyright UC Regents. All Rights Reserved.